Great detective work to everyone who was able to figure out what areas we updated! Here are some answers in case you weren't able to answer all of them. Q:Two states known for their majestic peaks have gotten an upgrade. A: Alaska was updated with new terrain and Colorado was updated with new imagery. Q: I can now see where my favorite maple syrup is made. A: Vermont was updated with new imagery. Q:Certain Florida beaches (and 1 mountain) are looking much improved. A: Orlando (Space Mountain), Daytona Beach, and Melbourne Florida were all updated with new imagery. Q: Try counting the warthogs in the Boneyard. A: I have yet to count them all, but check out Tuscon Arizona and try yourself! Q: Peek inside the home of the Brew Crew. A: Just outside Milwaukee, you can see Miller Park, home of the Brewers, with its retractable roof closing. Q: You can read the Skin's logo painted on their field. A: The Washington Redskins play right outside of Washington DC, at FedEx field. Q: An historic state capitol building is now in high res. A: Historic Charleston, West Virginia is now visible. Q: This city was named after the Native American name of a nearby mountain, "Tacobet." A: Tacoma, Washington is the name of the city. Q: A "far away" city that played a key role in trans-Saharan trade can now be seen close up. A: As the saying goes... "From here to Timbuktu"
Q:The town where Jane Austen spent her final years is much clearer. A: Jane Austen spent her final years in Winchester, England. Q: The topic of Vincent van Gogh's Cafe Terrace at Night is now bright as day. A: This cafe is in Arles, France. It is now called Cafe Van Gogh (try searching for it in Google Earth). Q:Take a look at "la ville noir," where Cointreau was invented. A: Cointreau was invented in, and only distilled in, Angers, France. Q: Only a third of this country's land is arable, but you can now view the entire country in high res. A: Italy is now covered with SPOT 2.5m imagery. Q: From 1880 to 1884 this German city was home to the world's tallest building. A: Cologne is the city name you were searching for; the Washington Monument took the title from Cologne. Q: Rockets may be used to disrupt rain clouds over this city next summer. A: It is said that rockets will be used above the skies of Beijing to prevent rain during the 2008 Summer Olympics. Q: This country received an impressive terrain update, you might call it Lord of the Terrain. A: New Zealand has been updated with 10m terrain; the mountains are especially breathtaking. For a more complete list of updates in this push, see the notes below. StopGenocideNow is a grassroots volunteer organization that is working to halt the ongoing genocide in Darfur. Three of my friends from StopGenocideNow have been visiting refugee camps along the Chad-Darfur border, and we've put together a video blog map to help put names and faces to the people who have been affected by what the United Nations has described as one of the world's worst humanitarian crises. You can also learn more about what's going on in Sudan by checking out the Crisis in Darfur layer in Google Earth or by visiting the United States Holocaust Memorial Museum's page on Darfur. By the way, StopGenocideNow also posed a question during the recent CNN/YouTube Democratic debate, asking the candidates what they would do to stop the genocide in Darfur. You can see the candidates' responses too. The Google Earth Community (aka BBS) is a geographical repository created by over 850,000 local experts who are as diverse and interesting as the places they post about. Being a member requires no mapping training, just the desire to explore. It's the urge to discover and communicate with others that makes the Google Earth Community such a valuable resource, and its ability to influence people's geographical awareness encourages these everyday users to create innovative and fascinating stories of our planet. The "Biography of Neil Armstrong" is a prime example of the way people tell those stories. Their annotations of the planet demonstrate that part of geographically organizing the world's information involves not only collecting the best mapping data sets, but also providing a geographical context for the information displayed. Thousands of placemarks created by users form a significant part of Google Earth's layers. These represent different languages, opinions, and cultural backgrounds that all come together in an integrated "geo-browser." You can view them by turning on the "Google Earth Community" layer and "Geographic Web." The Google Earth Community has a wide diversity of people that interact with each other daily. While some have a background in GIS, many do not -- and they are not what you would think of as "typical GIS users." For example, a French artist used Google Earth to display her works of art. She made the point to me that, while she may not have the professional reputation of some other artists yet, her ability to create a Google Earth file and show it on the community has boosted awareness of her work. And any description of the Google Earth Community is incomplete without mentioning the dedicated team of moderators who monitor posts, assist members and create a welcoming atmosphere for the inhabitants to construct. The ability to share discoveries is part of indulging our natural curiosity. Last year, a user called 'earthling_andre' noticed what appeared to be a burning ship off the coast of Iceland. With the desire to know stimulated, members shared their research and opinions. By a stroke of luck, one member was able to help significantly. Why? Because he was the captain of the rescue vessel. 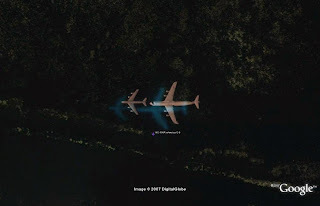 Aircraft in Flight (Aircraft that have been captured in flight by the imaging satellites and aerial photograph providers) is another great source of discovery. Every day, hundreds of planes captured in flight are found, posted, and collected. My favourite is this one of a C-5 Galaxy being refuelled by a KC-135 Stratotanker. The BBS also acts as a portal for scientists, organizations, and developers to share their current work. Examples include the palaeogeology of Earth, the effects of Gas Drilling and for a bit of fun, we have bouncing globes and rocket racers. And the Google Earth Community is just a small part of a much broader "Geographical Community." Anyone with Google Earth can annotate, inform, and shape the world by creating and posting a KML / KMZ (the file format used in Google Earth) to any website. With features such as Geo Search now available, great content can be indexed and searched no matter where it resides. Today, we're pleased to announce the newest version of Google Earth Enterprise. The enterprise solution brings us into close contact with some of the most advanced users of geospatial tools, and by meeting their needs, it helps make the product better for everyone. And enterprise users are some of the most active in using the products and also making contributions to the Google Earth and Maps user community, with data, blogs and mashups. Browser integration with the Google Maps API AJAX architecture, allowing 2D map views to be embedded in any web-based application, so everyone in an organization benefits from the power of Google Earth Enterprise. Performance enhancements amounting to as much as a 10x speedup for vector data processing and better than 2x reduction in server computation for responding to imagery requests. New search framework for integrating geocoding and other search services via Java plug-ins including a Google Search Appliance reference implementation. Regionator for creating Super-Overlays with Regions based KML and publishing them for viewing in any Google Earth client version (Free, Plus or Pro). Security improvements and extended Operating System support including Red Hat Enterprise Server 4 and SUSE Linux 9 and 10. For all these reasons, we say go forth and publish ever more geodata! I'm pleased to announce that we have acquired ImageAmerica, a company that builds high resolution cameras for the collection of aerial imagery. Google Maps and Earth users are no strangers to ImageAmerica's work -- the company provided high resolution black and white imagery of New Orleans following Hurricane Katrina. We're excited about how ImageAmerica's technology will contribute to our mapping services down the road. Since we're in the research and development phase right now it may be some time before you see any of this imagery in Google Maps or Earth -- we'll keep you posted on this blog! A few months back, Google Earth team and NASA began a collaborative effort to bring awareness and promote knowledge of NASA's "earth" programs. After months of production, the "NASA" layer group is now live in Google earth. Personally, I find it quite eye-catching. People are usually familiar with NASA's space missions, but not everyone knows that NASA also devotes a considerable amount of effort to Earth explorations. This new NASA layer group showcases some of their most interesting content. Beginning with the Mercury missions in the early 1960s, astronauts have taken photographs of the Earth. The "Astronaut Photography of Earth" layer showcases some of the best of photos from the online Astronaut Photography collection. The "Satellite Imagery" layer highlights some of the most interesting Earth imagery taken by NASA satellites over the years. Some placemarks also offer the option of downloading additional imagery from different years or seasons and overlaying them on the earth's surface. Being a space program lover, I used to spend hours on the NASA website looking at these photos, so it's nice to have them at my fingertips. Be sure to check out the satellite image overlays of continuous eruption of Mt. Etna at 37.730000°, 15.000000° if you are a volcano lover like me. "Earth City Lights" offers a new perspective on this popular image. One can identify some interesting urbanization patterns around the globe. I find it even more interesting to have roads and placename layers on at the same time as I fly over this layer. The United States interstate highway system appears as a lattice connecting the brighter dots of city centers. The Trans-Siberian railroad also shows up as a thin line stretching from Moscow through the center of Asia to Vladivostok. The Nile River can be viewed from a distance as another bright thread through an otherwise dark region. I really enjoy flying to different places around the globe, finding unexpected things and thinking about what the cause might be. In other news, we've also updated the European roads in Google Earth, adding 15 new countries in Europe, as well as adding more content for the Netherlands, like business listings layers and country names in Dutch. Check out these new and updated layers if you are planning a trip to Europe. When we were building the original Google Maps site, we envisioned that it would eventually become a platform for navigating all kinds of location-based information, such as home listings and travel information. Within weeks of the launch of Google Maps, we were pleasantly surprised that an independent developer named Paul Rademacher released HousingMaps.com, a site that displayed housing listings from Craigslist on top of our interactive maps -- what is now known as a "mashup" -- without needing help from anyone at Google. Hoping to encourage even more of this type of innovation, we released the official Google Maps API in June 2005, and since then, developers have created over 50,000 Google Maps mashups. In April, we released the first version of "My Maps," which empowers anyone to create a personal map simply by dropping placemarks onto the map. These maps are hosted on Google Maps and can be shared with friends and family. When marked as "public," these maps are automatically included into the Google Maps search index so that other users can find them. Since the launch of the "My Maps" tab, over 4 million maps have been created. While this drag-and-drop editor is a great tool, we still needed a solution to help with mashups that have dynamic content such as real-time weather conditions. Thus, we created the Google Mapplets platform, which enables any developer to create mini applications that overlay their content and services onto Google Maps. We announced a preview version of Mapplets in May, and over 100 developers submitted Mapplets within the first month. Today, we've brought these two features together under the "My Maps" tab on Google Maps. You can now layer information from multiple sources on the same map as well as save content that's relevant to you into a personal map. For example, if you're looking for a home in Chicago, you can add Mapplets that display real estate listings and Chicago Transit Authority train lines so that you can find out which homes are near public transit. To get an even richer sense of the surroundings, you could also layer in photos of the neighborhood and local events (from Zvents). When you find a home that you're interested in, simply click on "Save to My Maps" in the home's info bubble and save a copy of it to your personal map. To get started, check out this demo video and then head over to the "My Maps" tab to find great maps and tools you can add from the Google Maps Directory. Build Your Campus in 3D Competition - the results are in! Congratulations to the winners of Google’s Build Your Campus in 3D Competition! An estimated 4,000 campus buildings were modeled and submitted from all over North America. In August, the winning students and advisors (41 people from 7 teams) will be flying to our headquarters in Mountain View for a 3-day visit and workshop. Some thoughts from the judges…"Last week, we had the opportunity to watch college campus environments come alive with SketchUp and Google Earth. We couldn't help but be impressed with the effort put forth by the many teams and individuals who participated. The selection of finalists was the result of a lively discussion and a careful model review…You've set a very high standard and hopefully inspired those that will follow you." Visit the official competition website to see the winning campus models. As most of you probably know, we offer real-time traffic information on Google Maps and Google Maps for mobile -- great for when you're looking directions and want to see what's really going on out there, or for when you're in your car already and want to avoid the traffic jam up ahead. We've found, however, that one of the best ways to use this information is to do a quick check before your regular commute, and we wanted to make doing that as easy as possible. To help with this, this week we enabled real-time traffic on the iGoogle maps gadget, so you can take a quick peek at what's happening on the roads any time you look at your iGoogle page. If you don't already have the maps gadget for iGoogle, you can install it here. In addition to real-time traffic information, it gives you quick access to a map and local search results, so it's useful to have around for quick access to a map any time.